Our chickens arrive at the farm as day-old chicks. 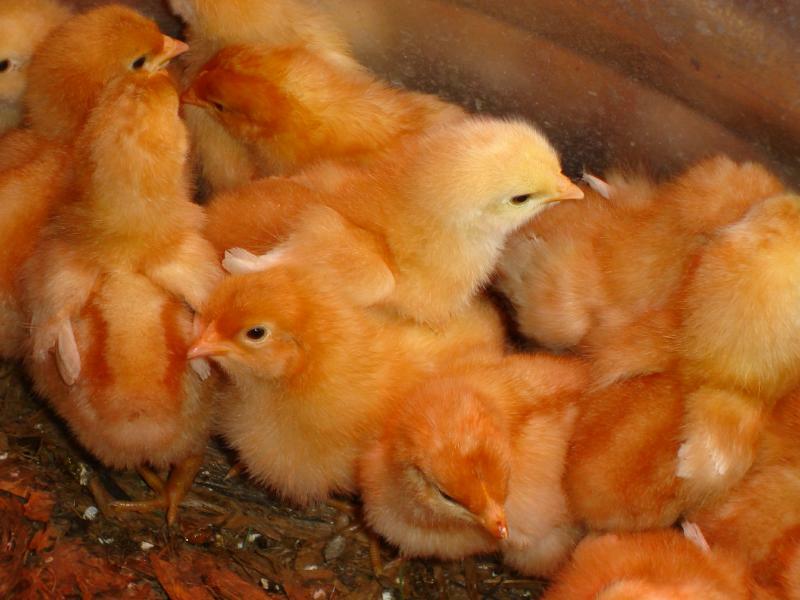 We brood them indoors for 2-3 weeks until they feather out and are able to withstand outside temperatures and weather. 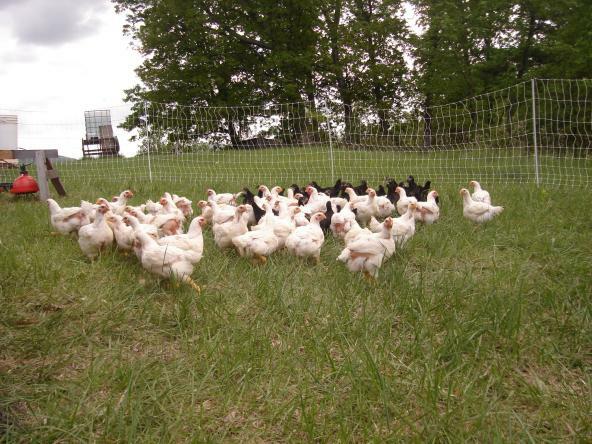 We then introduce them to their pasture home, an enclosed area surrounded by electric poultry net fencing. This is sometimes referred to as the day-range system of pasturing poultry. The fencing keeps possums, raccoons and other chicken-loving predators away from the birds. The chickens seek shelter from rain and sun under a hoop house that can be moved within the fencing. 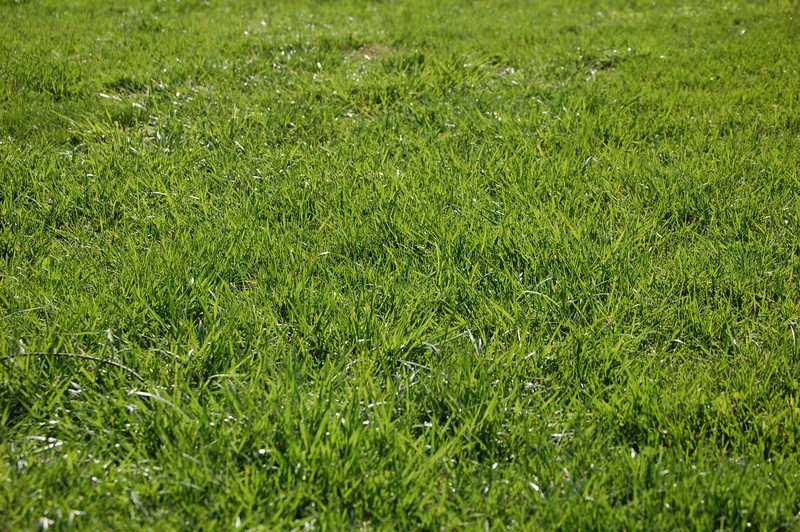 When it's time for fresh grass, usually about every 6-8 days, the entire fence, hoop houses, feeders and waterers and birds are all moved to the next fresh patch of pasture. While on pasture, the chickens enjoy a buffet of grasses, clover, juicy grubs, flying insects and whatever else they can get their beaks on. We supplement the bird's forage with a non-GMO feed (the Salatin mix) milled at Sunrise Mill in Stuarts Draft, Virginia. We are happy to offer three breeds of chicken for your table. We raise the white-feathered Cornish Cross broiler, the tri-colored Freedom Ranger broiler, and the Plymouth Barred Rock, a heritage breed chicken. For a description of how these birds differ, please see Our Products page. We process all our poultry here on the farm ourselves several times each year. For a list of this year's processing dates, please see Our Products. We chose the picture of piglets out on pasture as our homepage photo because we so love seeing pigs outside on pasture where we think they were meant to be. 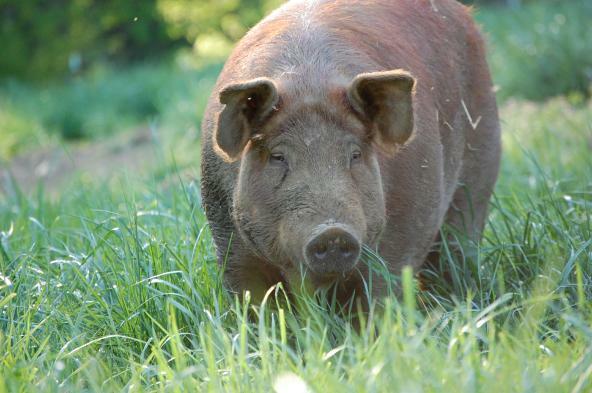 We breed and raise Tamworth pigs, a heritage breed of hog known as Irish grazers. 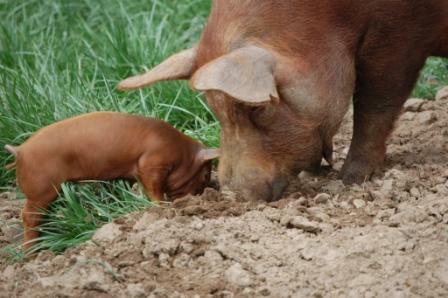 You can read more about our work with breeding Tamworth pigs on our Heritage Breeds page. Our piglets are farrowed in farrowing huts on pasture and are nursed by their mothers for about 8 weeks (some nurslings still nurse for several months if the mothers will let them!). Beginning at about 1-2 weeks mother sows show their piglets how to be pigs by teaching them to root for goodies in the pasture. From the time they are able to eat feed, our pigs' diet of forage is supplemented with a non-GMO corn feed milled at Sunrise Mill in Stuarts Draft, Virginia. We're working on having more natural feedstuffs available to the pigs and this year just added a forest paddock where the pigs can roots for tubers and other forest mast. The forest paddock also gives the pigs access to shade during the hot summer months and a great place to cool off in a small stream. We raise our pigs until they are about 6-8 months old and then we take them to be processed at a local processor, usually twice a year. There's nothing quite like the taste of pastured heritage breed turkeys and we are happy to offer them for your Thanksgiving table. We raise only heritage breed turkeys like the Bourbon Red, Narragansetts, and Black Spanish here at the farm (see our Heritage Breeds pages for more information). 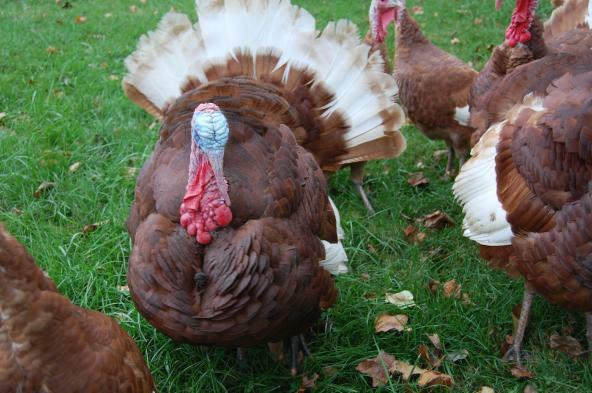 As you can see from the picture on the right, our 2009 turkeys were truly free ranging! 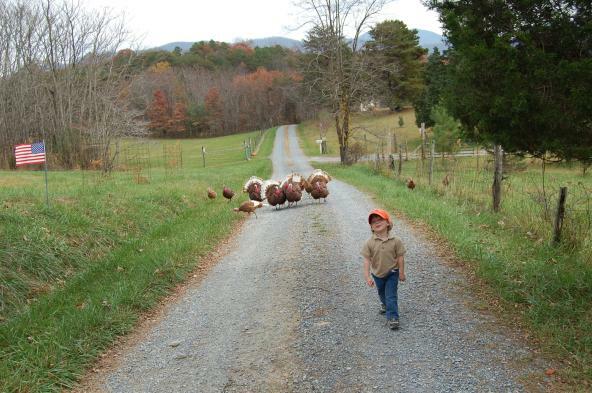 In the picture to the right, Jack was herding the turkeys from their quarter-mile hike down the road. They were searching for persimmons and acorns and took a little afternoon stroll to find them. We prefer that the turkeys stay inside their electrified poultry netting and roost on their roost bars at night, but sometimes they have other plans. We supplement the birds' persimmons, hickory nuts, acorns, pasture, and grubs with the same non-GMO feed that we give our pastured chickens. It takes these birds 7 months to grow to eatin' weight and we process them on-farm the week before Thanksgiving. 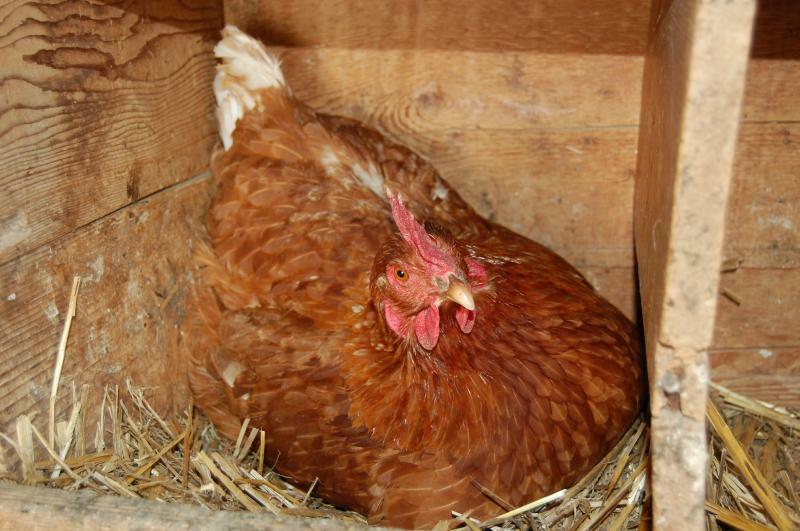 The farm is home to all kinds of egg-laying hens. We have a yard flock of banty chickens, Leghorns, and a cornucopia of other breeds and we have a pasture flock of Black Australorps. Some of the chickens lay brown eggs and some lay white. We even have a few that lay bluish-green eggs! All of the egg layers are pastured, some free-ranging and some inside electrified poultry net. The benefits of eating grass-fed meats are many! Pastured meats are clean, healthy meats. Animals that eat a diet rich in leafy greens and protein-rich grubs are better for your health than those raised on grain only. According to articles in the Journal of Animal Science, meat from grass fed animals has less fat, less saturated fat, fewer calories, and less cholesterol than meat from their grain-fed counterparts. Grass-fed meats have more vitamin E, C, beta carotene, omega-3 fatty acids and the health-promoting fat, lineolic conjugated acid. Because of their environment, pastured animals are healthier. They aren't stressed out due to overcrowding and cruel handling conditions. We do not use any vaccinations, medications or antibiotics on our naturally-healthy animals. Sunshine, fresh water and good pasture are what help keep our animals healthy and happy.